Yesterday, I showed that StatCast's Batted Ball Velocity data is correlated, at least, to performance statistics like ISO and HR/FB rate. We've received another, similar, data source this year: BIS's Quality of Contact ball classifications. 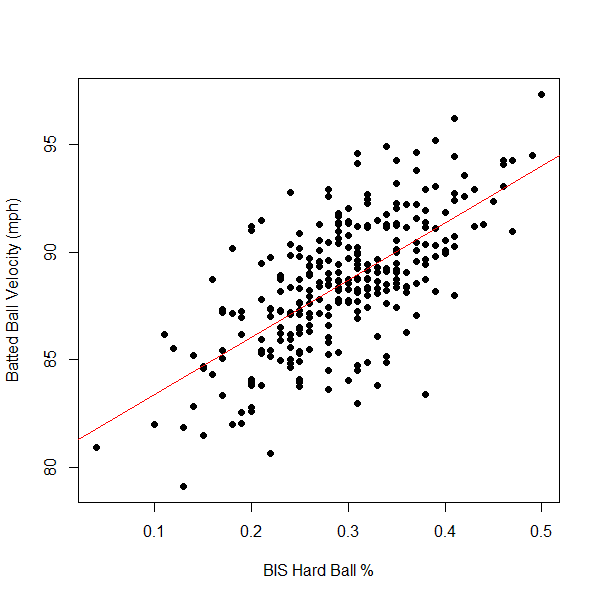 For each batted ball, BIS classifies the balls as either "Hard," "Medium," or "Soft." They're not recording actual velocity, but these aren't purely subjective either. They apparently use a combination of hang time and landing spot information to determine the quality of contact category. 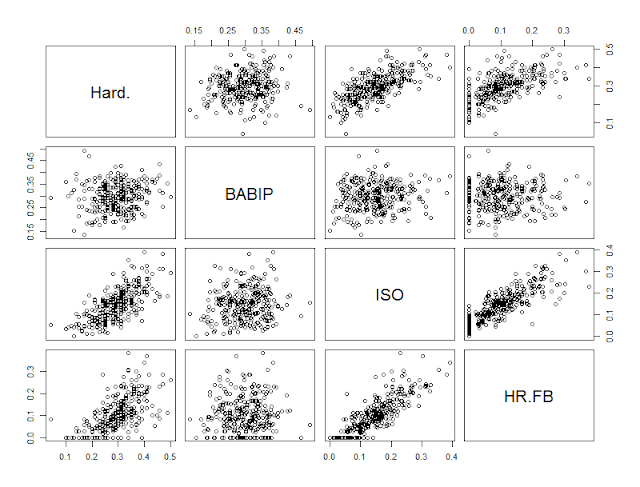 So, the question is, how well do these correlate to the (hopefully) more accurate StatCast data? Pretty well! If you look across the top row of the matrix, you see Batted Ball Velocity (on y-axis) plotted against Hard %, Med %, and Soft %. You can see that it tracks very well with Hard Hit Ball %, in particular, and shows a pretty strong negative correlation with Soft %. This is just as expected, but it's nice to see the data looking pretty solid. 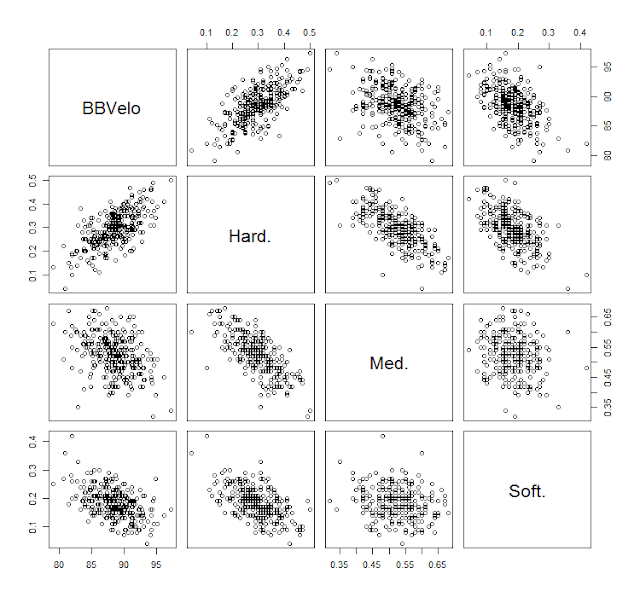 Interestingly, Batted Ball Velocity also tracks negatively with Med %, though it's a weaker relationship; the harder you hit the ball, the fewer medium-hit balls you will make. Similarly, Hard Hit % is negatively correlated with Med % and Soft %. 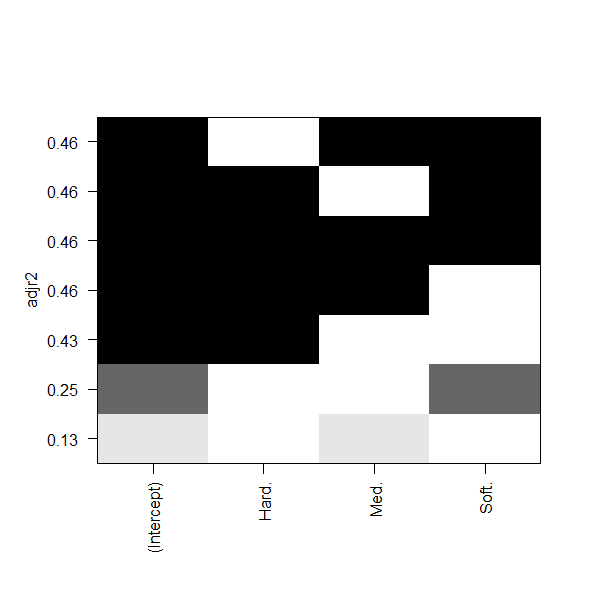 This is kind of a weird figure, but what it shows is the quality of fit (as measured by adjusted R2 on the y-axis) versus the different possible models (shown on the x-axis). What we see is that a simple regression predicting Batted Ball Velocity with Hard Hit Ball % alone gives an adjusted R2 of 0.43. It is, by far, the best of the single-variable models. Furthermore, adding additional variables provides almost no additional explanatory power (it maxes out at 0.46). Therefore, our best option is to simply predict Batted Ball velocity using Hard %. R2 = 0.43. 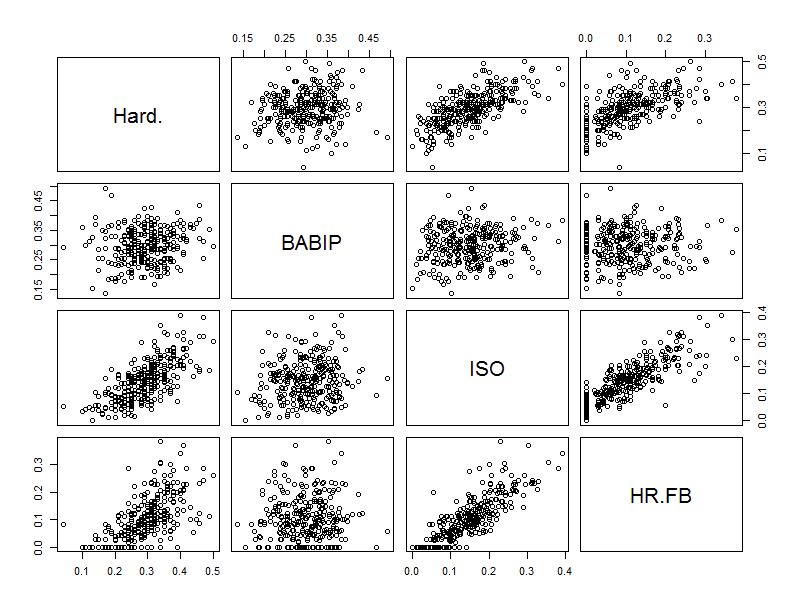 It looks like, most of the time, you'll be within about + 5% of the actual batted ball velocity using Hard %. Maybe it gets better with larger samples; well see later in the season. So, in short, while I love using actual velocity data, the Quality of Contact Data--and particularly the Hard % data--provided by BIS looks to be high quality and very usable.